Please note that there are several programs available through IEW but this review is for the TWSS DVDs and teacher’s manual only. 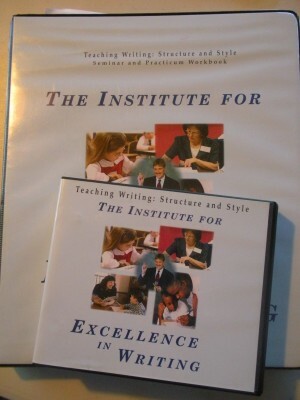 The TWSS DVDs are for the parent to watch and glean techniques and ideas in order to guide their children through the writing process. They are the beginning step to using the IEW system in your home school. Parents do not need any previous experience teaching writing nor do you even need to be a confident writer. 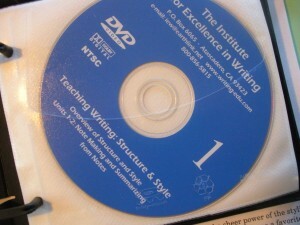 The TWSS DVDs will teach you all you need to know to help your children add structure and style to their writing. Guides the Parent: The TWSS method of teaching arms the teacher/parent and students with a variety of tools to use in their writing. The IEW system is a system that builds up a great foundation by introducing a structure that the child can use to express his thoughts in a logical and meaningful way. Each new skill slowly adds on the last skill. The DVD lessons in the TWSS series arm the parent with concrete ways to structure and then “dress-up” the student’s writing. Each lesson gives you specific objectives so the parent and student know exactly what the writing piece needs to accomplish. A whole new vocabulary is learned in the process and soon everyone is talking about quality adjectives and who-which clauses. (Link to a handout explaining more about dress-ups.) The most significant thing about the way new tools are added is that we are no longer trying to fix everything all at one time. The lessons help us to concentrate on the new tool introduced and to incorporate the previous tools into our current writing. Lessons Build From Elementary to High School: Each lesson in the TWSS plan is a baby step to more sophisticated writing. Starting with key word outlines and summaries, your child learns to gather information to write about each week. I love that I can tailor the topics we want to write about to the lesson and make it even more meaningful. My boys are now busy writing instead of thinking of things to write about. The flexibility to choose your topics and apply them to each of the lessons in the TWSS sequence is one of the greatest benefits of this program. 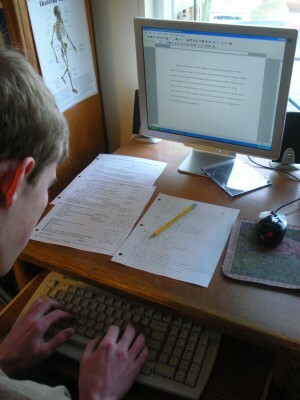 Tailor the Topics for Writing Projects: For instance, this week my boys are working on writing a research report. They both chose a topic from their current areas of study with one choosing a physics topic and one choosing a biography. They had plenty of fresh ideas from their studies to incorporate into their writing assignment. Remember that we did not start off writing research reports, but the TWSS lessons have built from one paragraph summaries to three paragraph essays to now a five paragraph essay with introduction, conclusion, and bibliography. Our next step after mastering the five paragraph essay is to work on what is called a “super essay” which is basically three five paragraph essays tied together with super introduction and super conclusion paragraphs. Unit 7-Creative Writing and introducing introductions and conclusions. Teacher’s Workbook: Along with the DVD lessons, you will receive a workbook with extensive notes for each unit, checklists, charts, and resources for your child to use with the lessons. Writing with Their Own Voice: It has always been important to me to have my children develop their own voice in their writing, to have the paper sound like it is from their own thoughts and reasoning. IEW has helped my boys use the IEW tools in a way that makes writing in their own words easier. At first the checklists provided with the lessons seemed cumbersome and awkward. They did not enjoy all the “box checking”. For instance, as the sentence openers are introduced they had to go back and rewrite a lot of their sentences to make sure they had used each sentence opener tool . (More on sentence openers in this IEW document, see page 7) The editing process was tedious and we all loathed that time of the week when we would review the writing and the checklist together. Progressively, each time we used the sentence opener tools in our writing, it became more natural. Now as the boys write an essay they can easily insert the sentence openers as they go along, they are on their mind. By incorporating the various style tools in the TWSS program, they have found their writing voice. Parent Involvement is High: If you are looking for a short-term fix or a program that you can have your child work through independently, the IEW system is probably not for you. The tools taught through the TWSS DVD lessons are helpful to the parent in their guiding the writing process with their own children. The tools are then used by the student to first learn how to structure their writing and then to incorporate style points to make the writing piece their very own. Your children will benefit from your help and support through the process of learning to write an summary, a story, and essays of all sorts. The DVDs included with the TWSS program can be used over and over and I have found it beneficial to watch them at the beginning of each school year. Bonus Student Workshop DVDs: Included in the TWSS DVD program are three disks showing at different levels how Andrew Pudewa teaches his writing workshops using the TWSS lessons. I highly recommend watching these along with your child after getting started with the TWSS plans. Free Resources: There are some free downloads available on the IEW website, both materials and pod casts. Online Groups: There is also a very helpful Yahoo Group IEW Families, that has lots of free lesson plans, writing helps, and suggestions for free that you can tap into. The moderator of this group is very good at answering questions so if you are undecided about whether to purchase this program for your family, you might ask her some more specific questions about how you intend to use the IEW programs, especially with younger children. TWSS DVDs have made me a more confident writing teacher and coach. I have the tools to do what needs to get done to step my boys through learning to write wonderful essays and then some. The emphasis is on creating great writers all throughout the TWSS plans. All parents can teach writing structure and style using this great product. I wrote a little bit of my random thoughts on IEW on my Harmony Art Mom blog a few months ago. You can read about it HERE. Thank you for that very helpful review! .-= Samantha´s last blog ..Choosing Between Good Things =-. This is a timely review as I’m just looking into IEW! Thanks! I am struggling with the price too but I think I will bite the bullet this year. Thanks for the write up. Thanks for sharing this through review. I look forward to your next one. Do you think the SWI has enough information to use it on its own if I have the TWSS notebook? I did part of the videos and still have the notebook, but I took it in a class and the videos belonged to the teacher. I should have borrowed them when I had the chance. 😛 Do you still refer to the videos? .-= Renae´s last blog ..Inexcusable =-. The SWI DVDs are for the student to watch and the TWSS DVDs are for the parent to watch. It really is a matter of personal choice. If you already watched the TWSS DVDs I would think you should be set. .-= Barb-Harmony Art Mom´s last blog ..Sketch Tuesday: Red Like A … =-. Excellent article. There is lots great information correct here, though Used to want to allow you know something – I’m running Mac using latest experiment with of Firefox, and the actual design associated with the blog is kind associated with quirky for me. We will read the posts, the actual navigation doesn’t work so great.